Parker's Baby Blanket is finished! And, I used my Flip Mino to record a little lesson on applied I-cord borders. Here is the blanket without the border. And, here are my little videos! The first one covers getting the applied I-Cord started. Now I show you how to turn a corner! Now join the ends with Kitchener Stitch! Here is the Moderne Baby Blanket with the border! Notice how I have enough yarn left over to make a Baby Surprise Jacket? I always get 9 balls of each color so be sure I don't run out. I figure that I can always use up the extra Swish Worsted yarn in a sweater, or something! Thank you so much for these videos. They are amazing, and you are such a good teacher. You should consider making an instructional DVD for those of us who are advanced beginner knitters..I for one would buy it as soon as it came out. I'm really loving your videos. I'm finding them very helpful! As you build a library of these you might want to list them on a separate page on your blog (in addition to including them in your blog posts) so that you have a running index of tutorials. That little camera of yours is A-Mazing! And, you're a really great teacher. I think you should consider doing a video podcast, or a video knitting class or something. I really like these. I agree with Trish - excellent stuff and I would love a central place to come to later when I really need the help. This was great Kelly! I have wanted to see this for so long, and now I am going to try it tomorrow. Thank you, Thank you, Thank you. BTW- The camera you used did a wonderful job. I agree that you have a knack for explaining technical ideas and that you should put these tutorials in a separate part of the website so that we can peruse them at our leisure. (Oooh, that sounded so la-dee-dah, didn't it.) You know what I mean. Your videos on applied i-cord are really helpful. Thank you! Thanks for the videos - very enjoyable and helpful. One question: do you use that SSK variation all the time, or only for I-cord? That is so cool! I can't wait to try it. Thank you so much for creating these videos. I had wondered how an i-cord was attached to an afghan/blanket. Your instructions were very thorough and very easy to understand. I love how that looks and it's so easy. I'll definitely try it. I have a couple of new babies arriving soon in our family and this blanket seems like a lovely gift. I love your blanket colors! I'll definitely have to try this pattern. 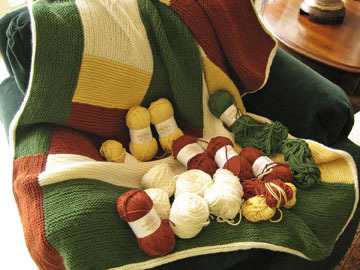 YAY - I'm working on my Baby Moderne Blanket and I'm thinking I would rather to the applied i-cord, and now I have a tutorial. THANK YOU! Thank you! Those were wonderful videos! I have always wondered how an i-cord border works. Man, if you could video the steeking of your cardigan, I would love you forever! Steeking seems so scary. Thanks again! I really love your idea of doing videos and demonstrating different knitting techniques. I am working on a project right now that will have an I-cord border. This was great timing! I hope you will do more. Thanks! Another big thanks Kelley! I have been listening to your podcast alot lately...the one describing the i-cord was great, but seeing it here as a video makes it so much better! Thank you so much for sharing your experience with the rest of us. You are truly inspiring! Hi Kelley! I had been listening to several of your podcasts this evening and thought I'd check out the blog as well. Am I ever glad I did! I've been inspired to make one of the Moderne Baby Blankets for my grandson (due later this year) and I love your videos. They will be such a help. That was a great tutorial! I've been struggling with the concept of applied icord, but that makes it MUCH easier to understand! Thanks so much! These were great!!! I just finished a "Modern Log Cabin Baby Blanket" and tried to do an applied I cord. I used the directions from Cat Bordhi's book. I was so confused. I just happened to see your link on ravelry and your video was great. 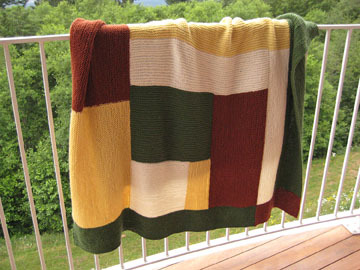 I will be doing another "Moderne Log Cabin Blanket" and have your site bookmarked. Can't wait to start. Still blogging but in a new place! Xena is my 8-year old Pomeranian. She is with me all the time with the exceptions of trips to countries with pet quarantines. So, I have lots of opportunities to take photos of her!